St. Andrew’s Episcopal School believes that a family’s financial situation should not prevent a student from attending the School. St. Andrew’s operates a need-blind admission policy. Therefore, a family’s application for financial aid will have no bearing on a student’s application for admission. The following procedures apply to families currently receiving financial aid as well as to those (including admissions applicants) applying for the first time. Families interested in applying for financial aid must submit a financial aid application form, available here, to the St. Andrew’s Episcopal School Financial Aid Office by February 1, signifying they would like to be considered for financial aid. We partner with School and Student Services (SSS) in our financial aid process. The entire application process is processed on-line and is kept confidential. To begin your financial aid application, you will complete a Parent Financial Statement (PFS). The PFS is a comprehensive application that will take some time to complete. Give yourself the time you need by not waiting until the deadline to begin. You’ll need your most recent tax return before beginning the PFS. We also recommend that you review the wide range of materials that SSS has put together to help families with the financial aid process. They can be found at sss.nais.org/parents. We will communicate our financial aid decision to you. To make our decision, we use the information from the PFS as a starting point but also consider our school policy, practices, and available budget. SSS does not decide whether tuition assistance will be given or how much to give; rather SSS provides a need-based financial aid analysis which includes a recommendation of what a family should reasonably contribute toward tuition. 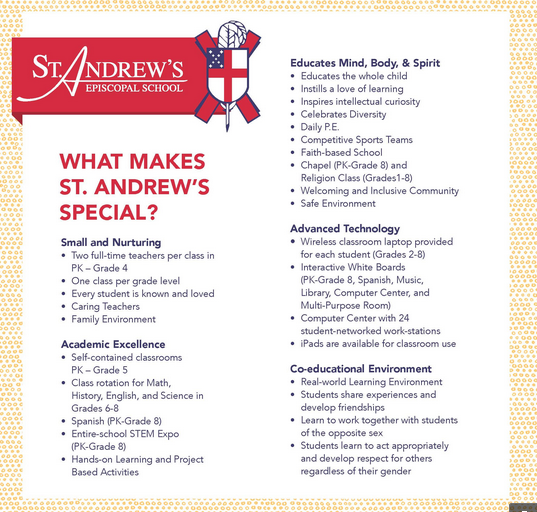 This helps St. Andrew’s make fair and objective financial aid decisions. To begin the on-line financial aid application for the 2015-16 school year, follow these steps below. Beginning October 2, 2018, go to the SSS Family Portal at https://sss.secure.force.com/familyportal. Complete a PFS for Academic Year 2019-20. You can log out of the PFS Online at any time, then return later to complete it. Once all PFS sections are complete with green checks, the “Submit & Pay” button activates. Follow the prompts to the payment screen. The fee of $51 is nonrefundable. Once your PFS is submitted, it cannot be withdrawn from the SSS system. After you pay for and submit your PFS, you have access to the Family Portal’s “My Documents” tab to upload required documents by their deadlines as part of your application process. Prepare your documents to be uploaded. Make sure the documents are on your computer and each specific form is saved as a separate file. Remove any security or password protection from your document files. Return to the Family Portal and log into your account. Select the Academic Year 2019-20 button. Open the “My Documents” tab on the Dashboard. On “My Documents,” use the Upload button or hyperlink associated with the specific document name in the “Required Documents” section. Clicking the Upload button or hyperlink leads you through the steps to locate, select, and confirm your file to upload. Click “Submit” to complete your file upload. After you do, the date will appear in the “Date Uploaded” column within minutes of the upload. Repeat this process until all required documents are submitted by their deadlines. Mailing in Documents: If you prefer to submit required documents by mail, you must print your Cover Sheet from the “My Documents” tab and send it with your documents to the address provided at least 10 days before their deadlines. All parents–custodial and non-custodial, natural and stepparent–must submit these forms by the appropriate deadlines to receive financial aid. In considering applications for financial assistance for separated or divorced parents, the School considers the assets of both parents before making any award, and will not be bound by the assertion that one parent has disclaimed responsibility for educational expenses. Any student to whom financial aid is awarded can expect that aid to continue as long as he remains in good academic and disciplinary standing at St. Andrew’s and provided his family continues to demonstrate need and is not in financial arrears. Application for assistance must be submitted annually. Please contact Lisa Witter, Director of Advancement, Enrollment & Financial Aid at (504) 866-6553 or lwitter@standrewsepiscopalschool.org if you have any questions concerning financial aid.